There’s no getting around it – tastes vary widely and this holds true when it comes to furnishings, including beds. Some of us enjoy ornate and complex designs, while others prefer understated self-contained units. For those who belong to the latter camp, the challenge is finding a bed frame which fits that bill without being boring and unappealing. One solution to this conundrum is the platform bed. The majority of platform beds consist of a uniform, solid lower section that raises the mattress off the ground, and then supports the mattress with wooden slats designed to flex ever so slightly – lengthening the life of your mattress while providing excellent support. This design offers a stately and well-put-together look. Most platform bed buyers choose a design made of high-quality timber such as oak or pine, stained in the finish of their choice. This allows for matching the platform bed to other furnishings in the room, paint schemes, bedding and other interior design considerations. Some frames will come with high headboards, others with discreet ones, and for the truly minimalist look, some are available with no headboard at all! When most of us think of a bed, there are basic structures in mind. For very low slung outer-frame-only bed frames – or in the complete absence of any frame – there is the old standby bed base and mattress combination. However, the fact that many simple frames have come to incorporate some sort of sprung lattice bed base, and that mattress technology has improved, has meant a bed base is not strictly necessary. So what is one to do when craving the extra sturdiness a bed base offers as well as having the aesthetics of a bed frame? The platform bed shines here as well – these solid frames provide the type of supportive base suggested for healthy backs while adding that extra bit of quality design some buyers prefer. Another reason many choose a platform bed over bed base is the preference for a hard, non-porous surface coming into contact or being near the ground. 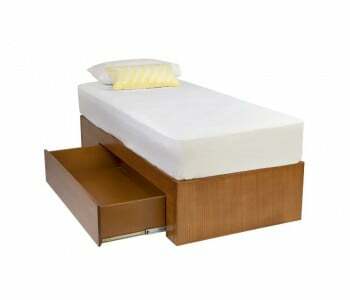 The platform bed also offers practicality and usefulness, for example, platform beds that offer storage space. Impossible with other bed types for obvious reasons, the platform bed’s construction allows for one or multiple drawers or cubbies to be included underneath the mattress. Widely popular for children’s rooms, these platform beds also prove excellent for guest rooms and boarding houses where visitors can store their belongings. Platform designs incorporating extra-low frames and floating beds are also extremely easy to move around and dismantle. They are fine choices when space is at a premium. More often than not, they will take up practically the same space (in length and width) as the mattress itself. And due to their sturdy nature, there is no need for a large footprint or wide frames in order to increase stability. There are different design styles available, including a variety of base designs and headboards. One of our most popular platform bed models is a stunning layered-platform piece with built-in floating bedside units and shelving. While we consider platform beds to be an ‘alternative’ choice, they have been a staple bedding arrangement throughout history. Some of the earliest beds were platforms filled with leaves and an animal pelt to increase comfort and separate sleepers from the ground. Platform beds were revered in Egypt, with kings and pharaohs having them made carved out of ebony and decorated with gold. While that would certainly impress visitors, we are proud to offer our own selection of fine-wood platform beds (minus the gold). For the best in platform beds, take a look at the BEDWORKS range.